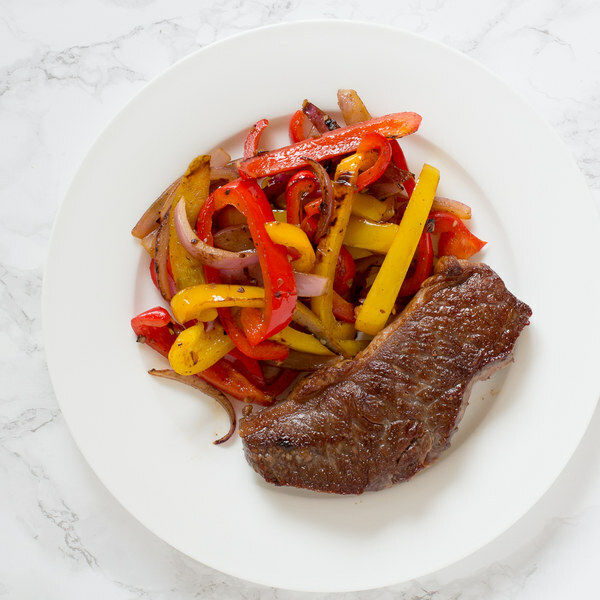 ← Striploin Steak with Balsamic Bell Peppers. Quarter the bell peppers lengthwise; remove and discard the stem, seeds, and membranes. Cut the quarters lengthwise into ¼-inch-thick strips. Transfer to a large bowl. Trim off and discard the ends of the onion and remove the outer layer; cut lengthwise into ¼-inch-thick wedges. Add to the bowl with the bell peppers. Trim off and discard the root ends of the garlic; peel and mince or press the garlic. Add to the bowl with the peppers and onion. While the skillet heats up, pat the steak dry with paper towels and place on a plate. Season with salt and pepper on both sides. Once the steak has been transferred, reduce the heat to medium and add more coconut oil to the skillet. Add the peppers, onion, and garlic to the skillet and season with salt and pepper. Cook, stirring occasionally, until the peppers are just tender and lightly browned, 3 to 5 minutes. Once done, remove from the heat. Drizzle the peppers with balsamic vinegar and toss to coat. To serve, divide the steak and bell peppers between plates.